When it comes to first-person shooter games on the Nintendo 64, there’s one title which stands out above all the rest: GoldenEye 007. During the late 1990s, Rare’s Bond-themed masterpiece provided gamers with countless hours of single- and multiplayer fun, and because of this it is still fondly remembered by many to this day. Perhaps more importantly though, it proved that the first-person shooter genre – which up until that point in time had more or less been reserved for the realm of PC gaming – could be done well on home consoles with the right approach. It cannot be understated: GoldenEye 007 was a landmark home console game, and one which held many N64 owners’ attention for months, if not years. 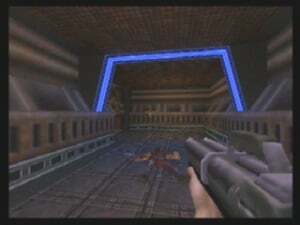 Because of this, it can be easy to forget that there were in fact quite a few other first-person shooters on the system, including some that originated from the pioneer of the genre, id Software. One of its most famous titles, Quake, was released on the PC in 1996 and caused a huge stir with its full real-time rendered visuals and online multiplayer. However, when it eventually arrived on N64 in 1998, it proved underwhelming, with one of its most notable shortcomings being that its multiplayer mode only allowed for a maximum of two players. 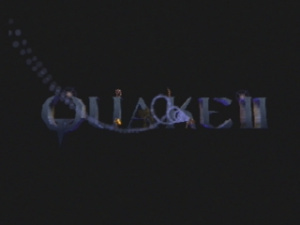 A year later, its sequel Quake II (which by this point had already been available on PC for two years) was also ported to home systems courtesy of Raster Productions. With it came finally the opportunity for four-player Quake on a home console in addition to a full single-player campaign, the latter of which is completely different from the original PC version. The end result is a port that’s entertaining, well optimised for the system in terms of performance, but also has some issues which ultimately impact the enjoyment which can be had from it today. Quake II’s single-player premise seems a little far-fetched, even by video game standards. Earth is under attack from an evil alien race known as the Strogg and there appears to be little hope of stopping them. In a desperate bid to save humanity, Earth sends hundreds of soldiers behind enemy lines to hit the Strogg where it hurts the most – their homeworld. It’s a risky, yet daringly brilliant plan; the only problem is that every single soldier sent on this exceedingly dangerous operation either gets captured or killed pretty much as soon as they arrive – well, that is except for you. Therefore, it’s up to you to single-handedly take on the Strogg and put an end to their insidious plans. Across a number of stages, you must complete a series of objectives while fending off numerous alien enemies with whatever weapons you can find. While GoldenEye 007 and Perfect Dark’s mission objectives often required you to explore an open environment and work out what to do, Quake II is much more linear. In this regard, it’s similar to id’s earlier first-person shooter masterpiece, DOOM, in that mission objectives amount to little more than pressing a button here and picking up an item there. That’s because the key focus in Quake II is fast-paced combat, or rather surviving it. Stages are filled with a smorgasbord of deadly enemies, ranging from standard Strogg guards to mechanised hybrids that pack quite a wallop. 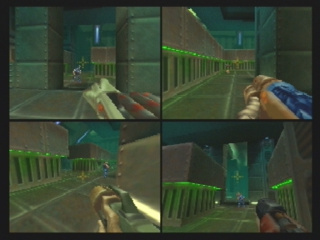 Set in a sci-fi universe, the varied alien environments are fully realised in 3D, and sport plenty of detail when the game is played using the Nintendo 64 Expansion Pak. Moreover, Quake II is one of the few N64 games that seems to actually run at a higher frame rate when using the RAM add-on. Without it, however, the game appears blurry and feels quite sluggish in places, especially when there’s more than a few enemies on screen at the same time. However, what really slows down the pace of the game is the actual gun combat itself. With the exception of the lowly guard types, the enemies in Quake II redefine the term “bullet sponge”, with most taking a ridiculous amount of shots to defeat. The pistol you start with is virtually obsolete the moment you get it, but even heavy weaponry such as the rocket launcher and railgun have a hard time downing some mid-level enemies — even on the easiest difficulty setting. Just to make things even more difficult, the on-screen crosshair doesn't line up with the trajectory of your shots, making long-ranged combat extremely difficult. Evading your foes isn’t really an option either, as they mindlessly run after you until you put them out of their misery. And if you're thinking you can just resort to stealth, then you're for in for a disappointment, as you can only do this if you happen to come across an incredibly rare invisibility pick-up. At times when you’re considerably outnumbered, it can make the combat much more arduous than it should be. While the enemy AI isn't as refined as it could have been, there are some neat touches which help to stop the combat from becoming monotonous. Enemies will dodge and duck fire as they approach you, and will sometimes spend their last seconds alive firing at you from the floor after you've delivered the fatal blow. Quake II, much like its predecessor and many of id’s other titles, is quite gory – even by today’s standards – with plenty of chunky ketchup squirting on to the screen while you play. To what extent this will positively or negatively impact your experience of the game is down to your personal preferences, but from a technical point of view it’s nevertheless impressively animated. 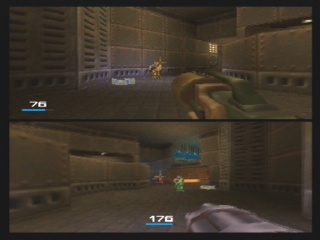 Quake II also comes with a split-screen version of its famous competitive multiplayer; up to four players can battle it out in four different modes. Thankfully, performance has been prioritised over visuals in this area, with the frame rate holding up the majority of the time. This does result in rather grainy visuals without the Expansion Pak, but it is nevertheless still a playable experience. As an arena shooter of old, Quake II does away with all the fancy modern guff such as loadouts and weapon drops, and instead forces you to scavenge the map for weapons, ammo and armour. This results in deathmatches that are strategic and fast-paced in nature, with controlling the heavy weapon spawn points being a key objective for all players hoping to win. 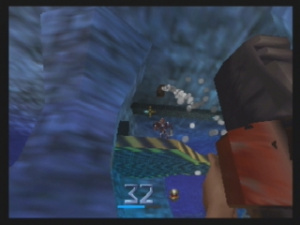 With lots of explosive and high-powered weaponry, matches quickly become chaotic with frags being a far more frequent occurrence than in other N64 multiplayer shooters. The game’s Capture the Flag mode offers a novel twist on the classic formula, in that a successful capture of the opposing team’s flag will result in them being insta-fragged in addition to you scoring a point. It really ups the ante and makes it quite easy for one team to dominate from the moment they capture the first flag. If there’s one thing that may hinder your enjoyment of Quake II today, it’s the control scheme, which is borrowed from Turok: Dinosaur Hunter (although you can change it to a setup that is similar to GoldenEye 007); you use the C-buttons to move, and the stick to look around. With some tweaking, the stick is certainly quite usable, although that’s partly down to the fact that enemies tend to charge straight at you. By default, your character will automatically run, which can prove bothersome when you’re trying to land on a specific platform or strafe an enemy. It can be switched off in the menu so that you move at a slower pace, but there’s no way to actually do it mid-game, which seems just a little bit odd. Quake II excels at providing a fast-paced first-person shooter experience on N64, and one which feels quite different from system stalwarts GoldenEye 007 and Perfect Dark. The single-player is a gruelling task, if only because of the enemies’ resilience to almost all kinds of weaponry, not to mention that hitting them is a bit difficult when you move so fast and your shots don’t line up with your crosshair. That’s not to say that it isn’t fun, but it does nevertheless require some patience. These last two issues are also present in the multiplayer mode, but given that each player is at the same disadvantage, it isn’t as big an issue. Moreover, the multiplayer feels surprisingly nippy for an N64 game and usually maintains a playable frame rate even with four players. It may not be as memorable or as deep in terms of gameplay as its Rare competition on the system, but Quake II is nevertheless entertaining, and especially worth experiencing if you miss the glory days of the arena multiplayer shooter. I completely forgot this series even existed! I didn't even know quake existed for the 64. Best way to play Quake 2 is with 3dfx. haha was just playing this the other day on my N64! Love this version! I was absolutely hooked on this back on the PC and when I got a N64, I made sure this was a priority game to get. Tons of fun on split screen multiplayer. It is still probably my favourite of the series, but it's hard not to also quiet enjoy "Quake III Arena", which I have a wonderful port on Dreamcast. Life sure was simpler in the pre-COD era. Quake III Arena is to this date my favourite first-person shooter. I played on the PC and on Dreamcast, and let's just say that I wasn't a fan of the DC controller for shooters, but the PC version was obviously ace. I never played the older games, but if it ever got a VC release (are we even getting N64 anytime soon? ), I'd probably dip in. My family used to play this back in the day. Multiplayer was always great fun, though in terms of gameplay the original quake is my favourite of the series. 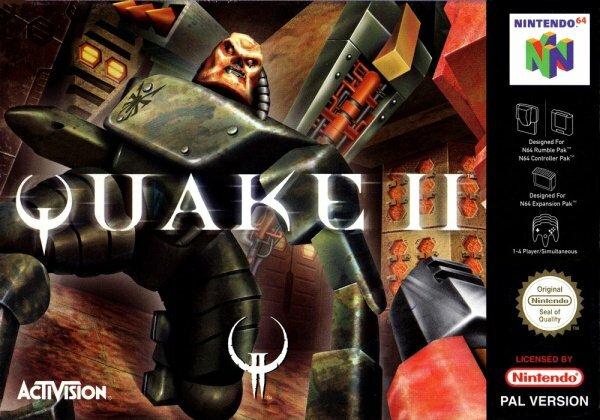 I love Quake 1, 2, and 3. But, the N64 versions were a let down. They just can't compare to the PC versions. I'd rather play Goldeneye, Turok 2, Turok 3, or Perfect Dark. I keep forgetting to get this! I'll try to remember it next time I go to the mall. I liked this game a lot better than the PC version. Feel a bit stupid and let down now don't I! Rented this a few times back in the day and loved the multiplayer but didn't think the solo was very fun. The turok control scheme is the ONLY way to play FPS' on the N64! Wish this came to WiiUs VC. @AhabSpampurse It's one of those setups where once you get used to it, it really delivers! I'm also left-handed (but normally play with the standard right-handed setup in games), so it doesn't feel too alien to me! I enjoyed my 64 version...but i also remember playing on the pc with grappling hook mod and that was more fun. Is this coming to VC or something??? I wish it would. Duke Nukem 64 was also really good imo. Many cool weapons and a ton of mp levels, each with many secrets. Great times. Wouldn't it be awesome if these were released on the VC, with online mp added? It was a fine game...but it did made b*tches of anyone? I don't think so. I will wait for the Daikatana review, I am predicting an eleven out of ten score. @unrandomsam Werd. Voodoo 3dfx was an amazing card for its time, and ID Software took full advantage of it. This game was played tons of times, and I remember some of the cheat codes by heart. I only ever played quake 2 on n64 and I only found out a few years ago that it has a completely different campaign to all the other versions. I remember being quite impressed with quake 2 for the 64 when it was released, really fun game. @Guovssohas Totally agree. Doom and Duke Nukem 64 were fantastic ports and I played the crap out of them along with The Quake 64 games. The N64 was home to some pretty competent first person shooters back in the day. Goldeneye, The World is Not Enough, Perfect Dark, Doom 64, Turok etc....and for the time they looked & played quite well. Every idiot liked Quake back then. I was not one of them. I mean it was an great game series. 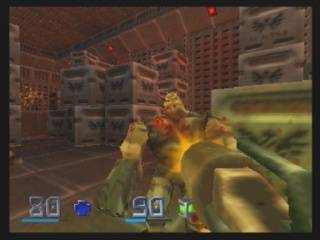 N64 did have many FPS games like "Eye of the beholder" and so forth. However the PSX had so much animated bliss on it. Of course thinking about this game; only people having any fun was the owners of the official quake. This game was more or less an outlit for kids who had no internet connection at all. Never knew about Quake online and stuff like that. Sad in my opinion. Even DOOM was the rage. @AhabSpampurse I completely agree! Whoever reviewed this game is missing a brain- criticising it for being too hard(?!) then bashing the Turok control scheme told me all I need to know. This guy can't play jack. Deserves at least an 8. Fantastic title with a stellar multiplayer.